At the Access Options step of the wizard, specify options for accessing the storage system. The Protocol to use list displays protocols over which the storage system can work. Select check boxes next to protocols over which you want to work with the storage system. [For NetApp storage system working over NFS] During storage rescan, backup and restore operations, Veeam Backup & Replication automatically creates required NFS export rules on the storage system. If you do not want Veeam Backup & Replication to create export rules, clear the Create required NFS export rules automatically check box. If you plan to work with specific storage volumes, you can limit the storage rescan scope. In this case, Veeam Backup & Replication will rescan only the volumes that you select. Limiting the rescan scope reduces the amount of time required for the rescan operation. On the right of the Volumes to scan field, click Choose. In the Choose Volumes window, select volumes that you want to rescan. To exclude volumes from rescan, select All volumes except, click Add and select volumes from the list. To rescan only specific volumes, select Only these volumes, click Add and select volumes from the list. If you leave the Automatic detection option selected, Veeam Backup & Replication will rescan all volumes in the storage hierarchy. After you finish working with the wizard, you can change the rescan scope and start the rescan process manually at any time. For more information, see Rescanning Storage Systems. If you plan to use Backup from Storage Snapshots, you need to make sure that you include in the rescan scope volumes on which VM disks reside. Operations of storage rescan and Backup from Storage Snapshots are performed with the help of a backup proxy. On the right of the Backup proxies to use field, click Choose and define backup proxies that you want to use for these operations. 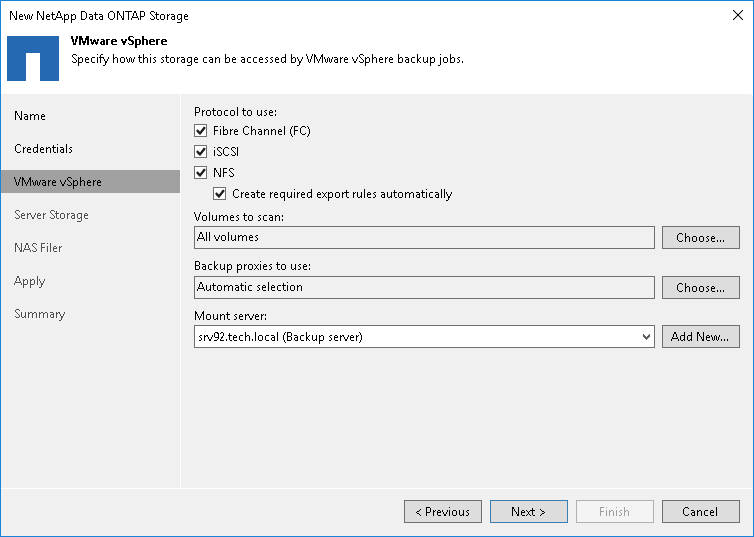 Select Automatic selection to let Veeam Backup & Replication pick a backup proxy automatically. Veeam Backup & Replication will check which backup proxies have access to the storage system, and automatically assign an optimal backup proxy for rescan and Backup from Storage Snapshots. Select Use the selected backup proxy servers only to explicitly select a backup proxy that must be used for rescan and Backup from Storage Snapshots. It is recommended that you select at least two backup proxies to ensure that rescan and Backup from Storage Snapshot are performed if one of backup proxies fails or loses its connectivity to the storage system. If you select backup proxies explicitly, you must make sure that you also select these proxies in settings of backup and replication jobs for which you plan to use Backup from Storage Snapshots. If a backup proxy selected for the job is not added to the list of backup proxies in the storage system connection settings and the Failover to standard backup option is disabled in the job settings, the job will fail. For more information, see Configuring Backup from Storage Snapshots.